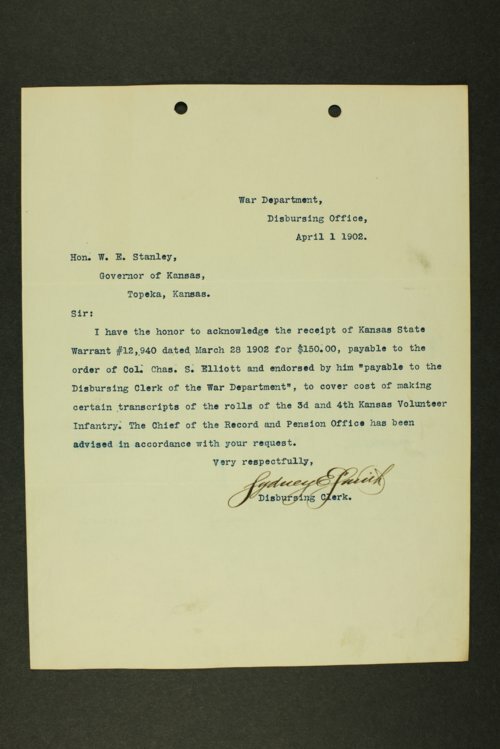 Correspondence sent and received by the Kansas Adjutant General's Office and the U.S. War Department between April 1902 - June 1904. Letters were also sent to Governor William E. Stanley and Governor Willis J. Bailey. Kansas Adjutant Generals during this period were Simeon M. Fox and Samuel H. Kelsey. Correspondents include Brigadier General William Crozier at the Office of the Chief of Ordnance, J. Parker and E.J. McClernand, Majors of Cavalry, and Quartermaster Generals Marshall I. Ludington and Charles F. Humphrey. Frequent correspondence was made with the Headquarters of the Department of the Missouri, in Omaha, the Headquarters of the Northern Division, in St. Louis, and the Headquarters of the Department of the Lakes, in Chicago. Topics discussed include military maneuvers, annual reports, and transportation arrangements.